Many existing satellites have been acquiring imageries of the damaged areas after the 2011 the Great East Japan Earthquake. Pleas click here to see the satellite imageries we can provide to you. 14:46 on March 11, 2011, a massive earthquake of magnitude 9.0 occurred around 130km east-southeast of Oshika Peninsula, off Sanriku. It was centered at 38.0°N, 142.9°E, with a depth of about 24km. PASCO attempted the automatic extraction of flooded area caused by the tsunami using the information from the synthetic aperture radar satellite (TerraSAR-X) acquired on 13 , 24 March 2011 and 4 April 2011. This automatic extraction method utilizes the characteristics of weak microwave reflectivity from the smooth surface (dark displayed). The pink area shows estimated flooded area of March 13, the orange area indicates the estimated flooded area of March 24 and the red area indicates the estimated flooded area of April 4. PASCO attempted the automatic extraction of flooded area caused by the tsunami using the information from the synthetic aperture radar satellite (TerraSAR-X) acquired on 13 and 24 March 2011. This automatic extraction method utilizes the characteristics of weak microwave reflectivity from the smooth surface (dark displayed). The pink area shows estimated flooded area of March 13, and the orange area indicates the estimated flooded area of March 24. The flooded areas were visually interpreted from before and after the earthquake satellite images, and overplayed on topographic maps. We hope those maps would be useful for planning the reconstruction of damaged areas and recovery from the disaster. *The interpreted area might be difference form the actual flooded area, since we have not conducted the field survey. PASCO attempted the automatic extraction of flooded area caused by the tsunami using the information from the synthetic aperture radar satellite (TerraSAR-X) acquired on 13 , 15, and 16 March 2011. This automatic extraction method utilizes the characteristics of weak microwave reflectivity from the smooth surface (dark displayed). The pink area shows estimated flooded area of March 13, the yellow area indicates the estimated flooded area of March 15, and the pea green area indicates the estimated flooded area of March 16. Comparison of temporal acquisitions shows the shrinking trend of the flooded area, but still it is continuing in the wide range. PASCO attempted the automatic extraction of flooded area caused by the tsunami using the information from the synthetic aperture radar satellite (TerraSAR-X) acquired on 13 and 15 March 2011. This automatic extraction method utilizes the characteristics of weak microwave reflectivity from the smooth surface (dark displayed). The pink area shows estimated flooded area of March 13, and the yellow area indicates the estimated flooded area of March 15. Comparison of temporal acquisitions shows the shrinking trend of the flooded area, but still it is continuing in the wide range. On March 14, 2011 (Monday) the optical satellite acquired images (EROS-B) of the first and second Fukushima Nuclear Power Plant at 13:37. Evening, March 15, Synthetic Aperture Radar Satellites (TerraSAR-X) acquired the data. The acquisition range is shown. The concentric circles of 20km around 1st Fukushima Nuclear Power Plant was created. ※ Please use the range (border) as reference. The estimated flooded area map extracted from Synthetic Aperture Radar satellite (TerraSAR-X) acquired on 13 March 2011 in northern Fukushima prefecture has been updated. Around 11:30 on March 15, the government expanded the area to be evacuated or stayed indoor against the 1st Fukushima Nuclear Power Plant for the safety of residents. Interpretation of the suspended and floating objects on the sea by Synthetic Aperture Radar satellites (TerraSAR-X) images. The suspended and floating objects on the sea identified from the information acquired by the TerraSAR-X on 13 March 2011. The data shows the information as of 13th March Morning. Since the situation is changing due to tidal flow, etc., please use as reference information only. The estimated flooded area map extracted and created from the information of northern Fukushima prefecture acquired by TerraSAR-X on March 13, 2011. 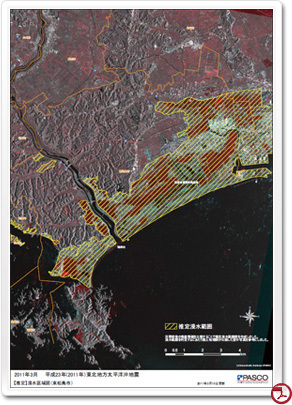 PASCO created the topographic change map after Tsunami around the Sendai city utilizing superimposed TerraSAR-X images acquired on October 21, 2010 (before the occurrence) and March 13, 2011 (after occurrence). This map indicates the change of the uneven ground surface utilizing the characteristic of TerraSAR-X images. The yellow area of the map is estimated flooded areas. PASCO created the topographic change map after Tsunami around the Sendai city utilizing superimposed TerraSAR-X images acquired on October 21, 2010 (before the occurrence) and March 13, 2011 (after occurrence) and this map indicates the change of the uneven ground surface utilizing the characteristic of TerraSAR-X images. The red and blue area of the map is estimated changed area (flooded). ※ Please use this map as a reference only. ※ The actual evacuation, please follow the instructions of government agencies. The footprint of buildings is shown cooperating with ZENRIN Co., Ltd. Synthetic Aperture Radar (TerraSAR-X) image was acquired in the morning of March 13. On March 12, the government instructed the evacuation at 18:25 to the residents within a radius of 20 km of the 1st Fukushima Nuclear Power Plant and within a 10 km radius of the 2nd Nuclear Power Plant for their safety. According to the 2005 census, it is estimated about 25,000 households and 78,000 inhabitants in the region. This map shows the range of evacuation. Estimated seismic intensity distribution map of the Great East Japan Earthquake, March 2011. Estimated intensity distribution map was created for the recorded M9.0 the Great East Japan Earthquake. ※This is a calculated intensity distribution map and it does not show the actual intensity. On March 12, 2011, at 06:00, the government instructed to expand the range to be evacuated from current 3km to 10km. This map shows the range of 3 km and 10 km from the 1st Fukushima Nuclear Power Plant. A huge tsunami occurred due to the Great East Japan Earthquake at 14:46 on March 11, 2011. Since topography was greatly affected due to tsunami inundation, PASCO extracted the area below altitude 10m. The damage caused by tsunami was very extensive. The maps are published separately as multiple sheets. The government issued the evacuation within 3km range due to the possibility of radioactive leak from the Unit 2 of the 1st Fukushima Nuclear Power Plant as it was resulted from the Great East Japan Earthquake took place at 14:46 on March 11, 2011. This map shows the range of 3 km and 10 km from the 1st Fukushima Nuclear Power Plant. From the view point of providing information to relevant organization and grasping situation of the distressed due to the disaster outbreak, PASCO CORPORATION began collecting and publishing of information. We extend our sympathies to everyone who was affected in this catastrophe. In line with grasping the precise disaster condition and disaster restoration, PASCO CORPORATION is, more than ever, making efforts to provide useful services in processing of spatial information as well as technical analysis and disaster prevention consultation. The copyright for the documents recorded in the disaster and emergency photos of this page belongs to PASCO CORPORATION. In addition, the copyright for the use of TerraSAR-X in this page is also the property of PASCO CORPORATION. Please contact us (see below) for permission to distribute or copy the information (documents and images) recorded in this page. PASCO CORPORATION strived to make the information in this page as accurate as possible at the time of publication; however PASCO CORPORATION does not guarantee integrity or accuracy of the information recorded in this page. PASCO CORPORATION accepts no liability for any loss or damage directly or indirectly, arising from the use of this information or contents. In case the information provided in this page is evidently different from the actual, in order to correct it please contact us using our contact information below.